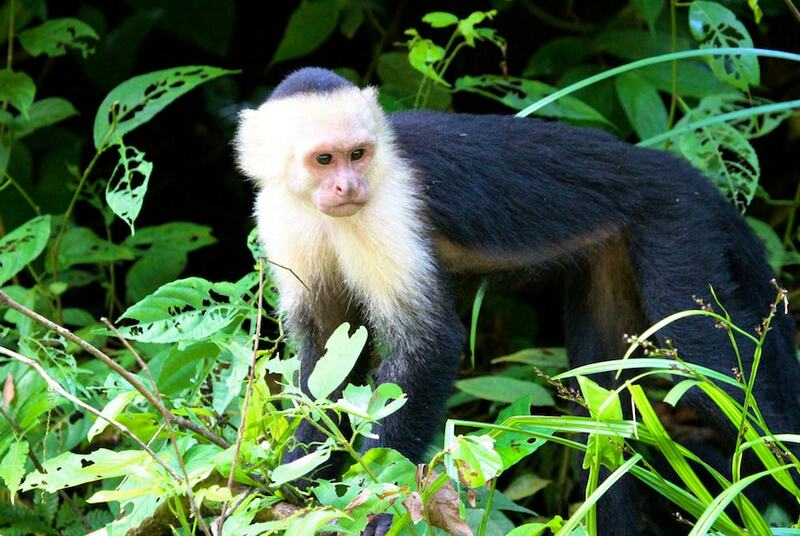 Researchers report that a troop of capuchin monkeys on a Panamanian island has been using stone tools to hammer open coconuts and crab shells. Tool-using behavior has not been observed in capuchin monkeys before. But other capuchin troops on the same island don’t seem to do it. Researchers are curious about what this might tell us about how such technological advances develop within a population. Sarah Kaplan, science reporter for the Washington Post, joins the program to talk about that story and other news from the week in science, including a National Academies report on the need for better procedures to protect other planets against contamination with Earth-based life, a guide to finding fossil dino tracks, and studies about how we view our own place in history. Sarah Kaplan is a science reporter at the Washington Post in Washington D.C..
JOHN DANKOSKY: This is Science Friday. I’m John Dankosky. Ira Flatow is away. Later this hour, a 19th century pioneering climate scientist who envisioned the water woes of the West. But first, this week of course was the 4th of July. Hope you enjoyed it. And that prompted lots of looking back on significant moments from our nation’s history. Now, many of us have some sense of pride in the contributions of our own states to the national story line, but is that historic pride overstated? Joining me now to talk about that and other selected short subjects in science is Sarah Kaplan. She’s a science reporter at The Washington Post and joins me from Washington. Welcome back to the show. SARAH KAPLAN: Thanks, John. Good to be here. JOHN DANKOSKY: Well, first of all, tell us about this study. Does this mean we’ve got an overstated idea of our own place in history in our states? SARAH KAPLAN: Yeah. So a lot of Americans, it turns out, think that they’re pretty important, and their state is pretty important. There’s this pair of studies that some psychologists conducted asking Americans how essential their state was to the history of the nation, and also looking at how essential they think the country is to the history of the world. And they found that basically everyone thinks they’re more important than maybe they actually are. The worst offenders were Virginia, Massachusetts, and Delaware. If you ask a person in Virginia, how much of American history is Virginia responsible for, they will say 41%. And they actually found that even after they forced participants to take a quiz that emphasizes the breadth of US history, the fact that there are 50 states, that had no effect on the outcome. It turns out that they still think they’re really important. And the same thing goes for the rest of the world, actually. It turns out Americans are not actually the worst about this. If you ask Russians how important Russia is to world history, they will say they are responsible for nearly 60% of the history of the entire globe. So meanwhile, the US is only at 29.6. So we’re actually relatively modest. JOHN DANKOSKY: Now, it may be true that Russia is pretty important to current history, but that’s a completely different story. What are the humble states? What are the states that don’t think that they’re quite as important as, say, Virginia or Delaware? SARAH KAPLAN: Kansas was pretty humble. And I actually don’t have that one on me. But the humblest country is actually Switzerland, which it’s home to 0.1% of the world’s population, but nevertheless claims credit for 11% of world history, which actually makes it relatively good on this scale. But the thing that this shows is that most people aren’t humble, and that we have this sort of– they’re investigating this idea of what they call collective narcissism. So people tend to think of themselves as better than average and associate themselves with successful groups. So it says it’s not so much about what we know about history. It’s more about how important we think ourselves are and our groups are. JOHN DANKOSKY: And does this have to do with specific events that happen in our states that we take pride in, or is it just a general impression? SARAH KAPLAN: It’s kind of just a general impression. That’s the interesting finding from having people take this quiz about American history beforehand, before they are then asked the question about how important they were. Even thinking about specific events and understanding how complex and long history is, and how many people took a part in it, it’s not so much about the actual details. It’s really just about sort of the grand idea. JOHN DANKOSKY: All right. Well, there was a big important event in Washington this week, some policy news with the resignation of EPA administrator Scott Pruitt. Were you surprised at all with this news? SARAH KAPLAN: Well, there has been a lot of controversies building up around Pruitt for a while now. He’s currently– he was facing, I think it’s a dozen federal inquiries. Investigators on Capitol Hill had had current and former EPA aides coming to the Hill for questioning. But I think that people were kind of surprised, because Pruitt has this reputation as a deregulator, which is a big part of the Trump administration’s agenda. And he’s also been an outspoken supporter of the president. And so he had been able to weather a lot of these ethics scandals that have come up. So it was– things were pretty busy on our environment team this time yesterday. JOHN DANKOSKY: I’m sure it was. So who is taking over for Pruitt, and what do we know about him, what it will mean for the environment? SARAH KAPLAN: So the deputy administrator of the EPA is this guy Andrew Wheeler. He was confirmed by the Senate earlier this year by 53 to 45 votes. So most Republicans and actually a couple of Democrats supported him. And he is a lot more low profile than Pruitt, especially when it comes to all of these scandals. Pruitt had been facing questions about his taxpayer funded first class travel, this soundproof phone booth that he had made for his office. So Wheeler doesn’t seem like he has any of those. But he’s still probably going to pursue a lot of the same policies that Pruitt had. He spent a decade lobbying for the kinds of companies that the EPA regulates, like mining companies and energy companies. And he also worked for Senator James Inhofe from Oklahoma, who rejects the scientific consensus on climate change. So he sort of fits in that same line with Pruitt. JOHN DANKOSKY: So let’s move far, far from Washington now. Let’s go further afield. Last week came some news of some findings on Saturn’s moon Enceladus. Tell us what what was found. SARAH KAPLAN: Yeah. So Saturn– Enceladus is– and you’re not supposed to have favorites as a journalist. You’re supposed to be objective. But Enceladus is one of my favorite moons. It’s this little icy body that orbits Saturn, and it actually is spewing– it has these almost geysers that spews ice and water vapor from its south pole. And so the spacecraft Cassini, which is a Nasa spacecraft that orbited Saturn until last year, actually flew through one of those plumes and took a sample. And what they found are these really large– or what Cassini found is these really large complex organic molecules, bigger and more sophisticated or more complex than almost anything that we found in the solar system. And that’s really exciting because organic molecules are one of the essential ingredients for life. And that’s one of the things that astrobiologists look for when they’re asking this question, is there the potential of life out there in the solar system? JOHN DANKOSKY: But just because we’re finding these organic compounds does not mean we’re finding life, right? SARAH KAPLAN: Yeah. So organic compounds, we call them organic because they are frequently part of organisms. They’re the building blocks of organisms. But there are non-biological processes that could produce them. So the compounds that Cassini found are these stable ring structures called [INAUDIBLE] and these long chains of carbon that are linked to hydrogen and oxygen and maybe nitrogen. And those are the kind of compounds that microbes, at least in Earth environments we find that microbes like to eat, and sometimes they produce them as a byproduct of their metabolism. So it’s another tantalizing clue in the search for life, and it suggests that Enceladus has this salt water ocean underneath an icy crust. And the fact that we can find these compounds coming out– and Cassini actually even sensed some compounds that were so big that it couldn’t even analyze them. They were too big for the instruments. And so it suggests that there’s something important out there worth going back and looking for. JOHN DANKOSKY: So if we’re looking for all this stuff out in space, and we’re looking for new forms of life, we want to make sure that we’re not taking our own life to other planets. What’s the news there in terms of our space program making sure we’re not taking our life elsewhere? SARAH KAPLAN: Yeah. So it’s actually– the timing of the Enceladus discovery, and also a couple of weeks ago, there were more results reported from the Curiosity Rover on Mars finding also very large complex organic molecules. And it’s interesting because the National Academies of Science, Engineering, and Medicine just put out a report saying that we need to be better about planetary protection. And when most people hear planetary protection, they probably think of like stopping a catastrophic asteroid impact or preventing an alien invasion. But what this report was really focused on is protecting other planets, specifically Mars, but just the rest of the solar system as we explore it, making sure that we don’t accidentally contaminate it with earthly microbes. And especially as private industry gets into the space exploration game, they emphasize the need for stricter guidelines and clear regulations to set up for potential human exploration. Because once humans land on– if humans go to Mars, which SpaceX says it wants to do, NASA says it wants to do by the 2030s, we’re probably going to bring our microbes with us. And what we found from life on Earth is that Earth microbes are really good at colonizing new environments. And so there is this worry that we might contaminate Mars with our own life, and then foul up the search for is there actual Martian life out there, or maybe there was billions of years ago. JOHN DANKOSKY: So it’s important to do that before all these other rockets, not state actors, get into space. I want to turn to your next story here. And this is really interesting. So a group of monkeys that seems to have entered the Stone Age. Tell us about this. SARAH KAPLAN: Yeah. So on this island called Jicaron off the coast of Panama, there had been kind of this rumor that there were monkeys there that used stone tools. Some scientists at the Smithsonian Tropical Research Institute in Panama had heard about it. And they finally went and investigated last year. They set up some camera traps. And what they found kind of blew their minds. These monkeys, capuchin monkeys, Cebus capucinus, they’re little cat-sized animals with white faces and long tails. And they were actually taking large stones, stones almost half the size of their body weight, and smashing them down onto flat rocks and logs and using that to crack open coconuts and other kinds of nuts, hermit crabs, snails, and get at the tasty morsels inside. So this is a stone tool. It’s like a hammer and anvil that they’re using to access food. And that’s exciting because this is only the fourth non-human primate species that’s ever been observed with this kind of behavior, using a stone tool. And it could help scientists understand what causes a species to start picking up stones and using them as tools, and also why our own ancestors might have entered the Stone Age more than two million years ago. JOHN DANKOSKY: But it’s just these monkeys in this one place. Other monkeys aren’t doing this. SARAH KAPLAN: Yeah, that’s the really weird thing, is that the– so this island is pretty big. It’s full of forests, and it’s inhabited with monkeys, and there’s similar islands nearby that have the same species of monkey. And yet only one group of capuchins was showing this behavior. And actually the scientists tried leaving out some experimental rocks in other parts of the island to see if the monkeys might pick them up and start using them. And the monkeys totally ignored them. They were not interested unless it was this one particular group. And so that’s a really strange thing, because you would think that if this is an evolutionary advantageous behavior, and that it helps them to sort of get at more food and get more resources, then the behavior would spread, especially because these capuchins are really fast learners. They’re very smart. And so it actually sets up a really interesting scientific question allowing them to compare, why does one group adopt this, while another group doesn’t? JOHN DANKOSKY: It’s so interesting. Sarah Kaplan is a science reporter at The Washington Post who joined us from Washington today. Thank you so much, Sarah, for bringing us these stories. SARAH KAPLAN: Yeah, thank you. These Science Books Were Made For Summer. Take Our Word For It. The SciFri staff recommends our favorite summertime science beach reads.